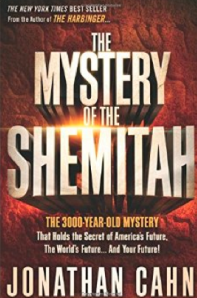 The book, The Mystery of The Shemitah, by Jonathan Cahn—a runaway sequel to his bestselling book, The Harbinger—has nearly rivaled the success of its predecessor—and has proponents of these ancient mysteries eagerly anticipating the economic destruction of the United States this September (when the “Shemitah” cycles end), in fulfillment of the apocalyptic and calamitous judgments, predicted in the so-called hidden end-time Jewish prophecies, Sabbaths (Shemitahs, pronounced sh’mee’-tah), and current Blood Moon Tetrad (aligned with Jewish feast days), detailed in Cahn’s books. There is extraordinary publicity ramping up over the dire events that are predicted to happen the last few weeks in September this year, 2015. Charisma, for example, just ran an article titled “10 Things That Are Going to Happen Within 15 Days of the End of the Shemitah,” which attempts to prophetically connect the Jade Helm military exercises, selected United Nations conferences, and even the Pope's upcoming visit to America events to the Blood Moons prophecies that have been popularized by men such as Jonathan Cahn, Mark Biltz and John Hagee. Article in Charisma News, 8/20/15, by Michael Snyder. 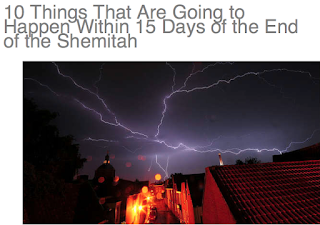 The caption to this photo reads: The Shemitah is rapidly approaching. First, because so many have been influenced by The Harbinger, and because this new book is already a bestseller, the Body of Christ needs to see that there is another side to the story that may not be completely obvious at first glance. And even for those who may sense that something isn’t quite right, the time it takes to work through the frequently slow and laborious, yet necessary, task of fact-checking is probably more than most readers will want to invest. Second, just as one of my goals in writing The Harbinger: Fact or Fiction? was to model the process of discernment, the same is true of this booklet. First and foremost, discernment involves checking against the Word of God to make sure that all the arguments, theories, and claims are biblically sound. Beyond this, discernment also frequently involves evaluating the logic arguments, the veracity of assertions from a historical perspective, and even the proper use of statistics, which, unfortunately, can be framed in such a way that the true picture is obscured or hidden from the reader, even if unintentionally. 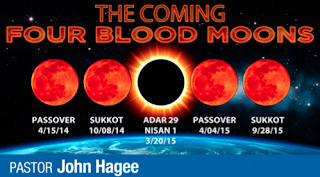 Are “Blood Moons” a harbinger for a catastrophic “seventh Shemitah” in America? evangelicals are susceptible to prophecy-mongering because disaster is indeed imminent! We don’t know the day nor the hour (Matt. 24:36), but Jesus is going to return and before that happens Scripture states that things will wax worse and worse (2 Tim. 3:13). Believers are told to “discern the signs of the times” (Matt. 16:3). There are plenty of “wars and rumours of wars” (Mark 13:7) and many other things to indicate that the time is getting close. In fact, potential disasters are a dime a dozen. Every day brings hundreds of new catastrophic scenarios that loom on the horizon. The Christian Right gets all worked up about the environmental crisis advocates' claims of global warming, but they have their own calamitous commotions. Should Christians get all revved up about these things – even before they happen, IF they are going to happen? Jesus’s answer to this was very short and sweet: “see that ye be not troubled.” Why? Because “for all these things must come to pass, but the end is not yet” (Matt. 24:6). In practical terms, this meant that the Babylonian captivity functioned as a God-imposed Shemitah, because with few Israelites left to cultivate, plant, and harvest, the Promised Land experienced a forced “rest”—a rest that totaled the exact number of years that the Israelites had failed to voluntarily allow the land to rest as the Lord had commanded (2 Chronicles 36:20-21). This IS a Shemitah Year- With the Final ‘Release’ Date in September 2015! What is the “Isaiah 9:10 Effect”? Thus, just as God had imposed seventy forced Sabbath years upon the nation of Israel as a judgment during the Babylonian captivity, He has likewise been visiting calamities upon America as warnings of impending judgment through stock market crashes, economic crises, and various other cataclysmic events—all because of the “mystery of the Shemitah.” Throughout the book, Cahn goes to great lengths in his attempts to demonstrate that this has been going on for at least a century in this country. And, as he did in The Harbinger, the author contends that the most recent cluster of devastating events began with the terrorist attacks of 9/11/2001 on the World Trade Center towers, the Pentagon, and United Airlines flight #93 (which he collectively refers to as “the first shaking”). Furthermore, Cahn claims that the mystery of the Shemitah has been working in conjunction with what he calls the “Isaiah 9:10 Effect”—a theory he proposed in The Harbinger as “The attempt of a nation to defy the course of its judgment, apart from repentance, will, instead, set in motion a chain of events to bring about the very calamity it sought to avert.” According to Cahn, the “Isaiah 9:10 Effect” has manifested itself as a “second shaking” with the precipitous fall of the stock market on the last day of the Shemitah year in both 2001 and 2008, according to the modern Hebrew calendar. But as James demonstrates at length in his critique of Cahn's first book (The Harbinger: Fact or Fiction? ), none of these things can remotely be found within the text or context of Isaiah Chapter 9. What is the “Blood Moon Tetrad”? Further building on these best-selling end-time mysteries and frightening hidden prophecies, at some point, Cahn’s Harbinger and Shemitah revelations became intertwined with the “Blood Moon Tetrad” teachings reportedly discovered by Hebrew roots Pastor Mark Biltz in 2008, and later popularized by Pastor John Hagee (both have published books on the subject), which say “that there is end-times prophetic significance to a set of four consecutive lunar eclipses falling on Jewish feast days in 2014 and 2015”—even portending the timing of the Tribulation—although these men deny that they are setting firm dates for these events to occur. 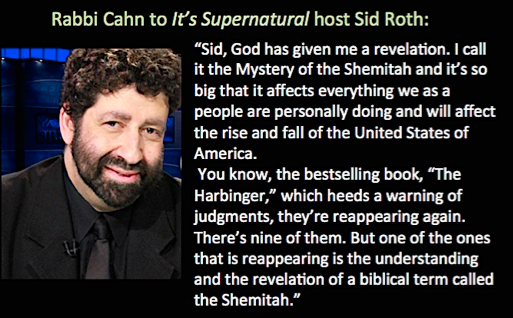 Jonathan Cahn has also been a regular guest on The Jim Bakker Show in connection with both The Harbinger and The Mystery of the Shemitah. 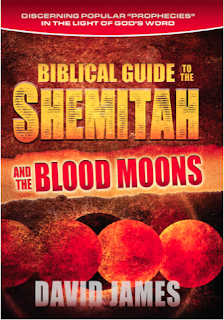 And in [The Mystery of the Shemitah], he, too, makes a connection between the Shemitah and the blood moon tetrad. 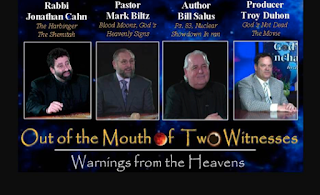 This would suggest that he, Bakker, and Biltz are all on the same page regarding the likely timing of the Tribulation, although Cahn tends to try to appear more noncommittal by saying things like, “I’m not putting God in a box,” or “I’m not saying it has to be this way,” and “It could be earlier or later.” However, in spite of these disclaimers, he spends the majority of the time speaking as if it will happen according to the dates of the Shemitah cycles, the Blood Moon Tetrad, and the two solar eclipses of 2015. The immediate problem is that if people think the Rapture, the beginning of the Tribulation, or the Second Coming of Christ are directly connected to these completely natural events, then they don’t have to be concerned with the idea that the Rapture could happen at any moment—which, given human nature, means that some won’t be prepared and will be caught off-guard. Those who haven’t trusted in Christ for salvation will enter into the Tribulation and experience the worst cataclysmic events this world has ever seen as God pours out His wrath in a series of devastating judgments. God purportedly revealed these mysteries (that are not clearly stated in the Scripture) to Jonathan Cahn—making Cahn a prophet of God. If so, then why would God send him such after-the-fact revelation—years after the judgments were already imposed? Cahn’s TMS is short on documentation, and much of what is documented comes from Wikipedia. Arguing for precision in the economic crises in America, Cahn misleads readers by switching back and forth between the Hebrew and Gregorian calendars. There is no clear presentation of the Gospel of Jesus Christ in Cahn’s The Harbinger. Those who are in Christ by faith have entered into the Sabbath rest that God has promised and prepared. Apart from Christ there is no Sabbath requirement, meaning that because Christ fulfilled the Law, God does not impose a Sabbath day or a Sabbath year (the Shemitah). God no longer expects Jews to continue keeping the Sabbath day or Shemitah. Rather, His desire is that they would enter His Sabbath through faith in Christ. Gentiles were never required to keep either Sabbath. Therefore, there is no biblical basis whatsoever for Cahn’s theory concerning an imposed Shemitah. Quite the opposite is true—his theory runs counter to the Word of God and the gospel. There are two significant and very real dangers associated with the hype surrounding the total lunar and solar eclipses this year and next. The first danger is that because biblically the Rapture really could occur at any moment, many could be caught unawares if they think they can legitimately wait until the Feast of Trumpets on September 28, 2015, to do something about their spiritual condition. Signs of the Second Coming? 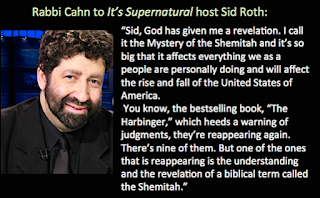 WND (formerly WorldNetDaily), “'Mystery of the Shemitah' hits publishing milestone: Jonathan Cahn's followup to 'The Harbinger' hotter than first book,” posted Sept. 9, 2014. WND is strong supporter of Cahn and major purveyor of his teachings; http://www.wnd.com/2014/09/mystery-of-the-shemitah-hits-publishing-milestone/. See also the copy from the DVD combo package of Cahn’s works from The Jim Bakker Show website; http://jimbakkershow.com/lovegifts/the-mystery-of-the-shemitah-final-update.html. Graphic taken from the Berean Research blog post of Amy Spreeman’s Sept. 22, 2014 review of David Jame’s lengthy article on the “Mystery of the Shemitah”; http://bereanresearch.org/book-review-the-mystery-of-the-shemitah/. David James’ article, “THE MYSTERY OF THE SHEMITAH: Is it real?,” was initially posted to his blog on Sept. 19, 2014; http://www.biblicalintegrity.org/2014/09/19/mystery-of-the-shemitah/. David James, Biblical Guide to the Shemitah, pp. 5-6. See: https://zionsgate.wordpress.com/2014/10/09/the-mystery-of-the-shemitah-book-review/. 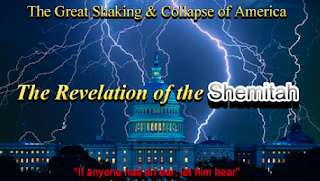 The author of this dominionist blog, Santos Garcia Jr., gives a favorable review of Cahn’s The Mystery of the Shemitah. See link to his book: http://www.amazon.com/Thy-Kingdom-Come--Here-Now/dp/1450518486/ref=sr_1_1?s=books&ie=UTF8&qid=1404496216&sr=1-1&keywords=Thy+Kingdom+Come-+Here+and+Now%21. Ibid, BGS, pg. 206 (Back Cover). Also found on The Berean Call (TBC) online bookstore; http://bereanresearch.org/book-review-the-mystery-of-the-shemitah/. David James’ The Harbinger: Fact or Fiction? is available at Amazon.com: http://www.amazon.com/The-Harbinger-Fiction-David-James/dp/1928660800; and from The Berean Call: http://www.thebereancall.org/harbinger-fact-or-fiction. 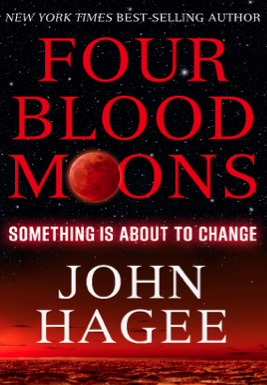 Pastor John Hagee, Four Blood Moons: Something is About to Change, Worthy Pub., Oct. 2013; http://www.amazon.com/Four-Blood-Moons-Something-Change/dp/1617952141; and Pastor Mark Biltz, Blood Moons: Decoding the Imminent Heavenly Signs, WND Books, Mar. 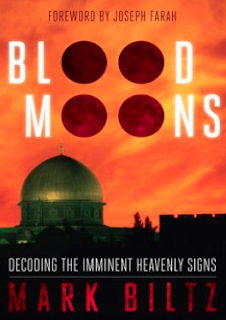 18, 2014, http://www.amazon.com/Blood-Moons-Decoding-Imminent-Heavenly/dp/1936488116. Ibid, BGS, pp. 46-47, 50. Ibid, BGS, pg. 57 (see also pp. 145-152). 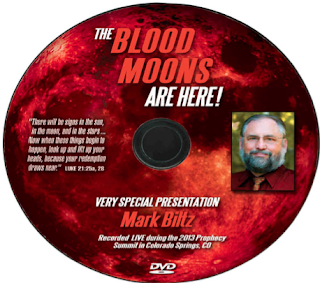 Mark Biltz was a presenter at the 2013 Pikes’ Peak Prophecy Summit in Colorado Springs, CO alongside a large cadre of Postmodern Prophecy Paradigm (PPP) leaders that Herescope has been researching for several years. See: http://skywatchtv.com/2015/06/25/when-shemitah-blood-moons-and-the-messiah-meet/. Jonathan Cahn was also a presenter. See Bill Salus’ website: http://www.prophecydepotministries.net/2013/pikes-peak-prophecy-confernece-july-26-28-2013/. Ibid, BGS, pp. 18, 22, 35, 111, etc. Ibid, BGS pp. 113, 117; see also, pp. 20, 113-115. Ibid, BGS, pp. 130, 132. See: Prophecy Depot Ministries; http://www.prophecydepotministries.net/. The DVD package of interview concerning end-time teachings of these men is also available from Postmodern Prophecy Paradigm (PPP) leader, L.A. Marzulli; See: http://www.lamarzulli.net/out-of-the-mounth-two-witnesses-warnings-from-the-heavens.php. 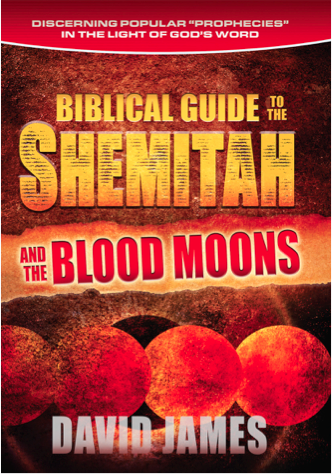 In addition, Jonathan Cahn’s books and DVDs concerning The Mystery of the Shemitah are promoted and sold on PPP leader Gary Stearman’s website, Prophecy Watchers; See: https://prophecywatchers.com/product/shemitah-package/.